The MarCELL Cellular Connected Monitoring System is a cell phone based product that monitors the temperature, humidity and power status in your remote home, business, vacation property or other sensitive property. No phone line or internet connection is required. 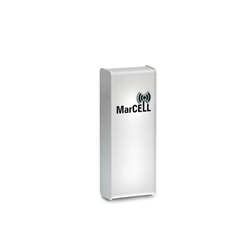 The MarCELL Cellular Connected Monitoring System communicates to an internet cloud application via an internal cellular modem already connected to the largest wireless cell phone carrier in the United States. The MarCELL sends pertinent data 3 - 4 per day to your cloud account where you can monitor the environment in your remote property any time you wish over your computer, laptop, tablet or smart-phone. If the MarCELL Cellular Connected Monitoring System detects temperatures that are too high or too low, if humidity is out of range or if the power goes out, the MarCELL sends an alert message to the cloud which immediately sends you a text message, email and a voice phone call warning of problems at your remote property. It even sends you alert messages when the power is restored. Seasonal at $11.95 per month – pay only for the months you want to monitor your property. Select a season from a minimum of 4 months to a maximum of 8 months. For a season longer than 8 months, select the more affordable Annual Plan. Annual at $8.25 per month. (1) One free month of service included only if user selects an Annual Plan. You get 13 months for the price of 12 months. Your MarCELL® constantly monitors its environment for temperature, humidity, power status and water leak alarms. If there is an issue, it reports this immediately. If there is no issue or the status has not changed since the last alarm, MarCELL® simply records the current conditions every hour and uploads this information to the website every 8 hours. So the information on the “history” page on our website could be up to 8 hours old. Some customers, especially those with pets, wanted a way to immediately get a snapshot of the current conditions. Sensored Life, LLC provides this capability with a feature they call “Instant Update”. To get the current conditions without waiting for the next update period, you simply select the “Update Now” button on either the dashboard or history screen for your MarCELL®. Within 1 minute, your web account will be updated with the current temperature and humidity status. There is a small charge for this service of 25 cents per update (sold in packs for 8 for $2). These Instant Updates never expire so if you use 1 now, the remaining 7 can be used at anytime in the future. Remember, if your temperature or humidity go out of range, your power goes out, or a leak is detected (using Water SPucks), you will always be notified IMMEDIATELY. If, however you just want to know what the current conditions are, Instant Update provides you a low cost option to do so. Simple: Create your account through www.sensoredlife.com, plug in MarCELL Cellular Connected Monitoring System and walk away – No phone line or Internet connection needed. Easy: The MarCELL Cellular Connected Monitoring System will notify you immediately via Text, Email, or Call of temperature alerts, humidity extremes, power outages, and when power is restored. Affordable multiple low cost subscription plans to choose from to match any budget starting at $8.25 per month on an annual plan. Peace of Mind: You can monitor the temperature, humidity, and power through your computer, tablet, or smartphone. Recycling of entire unit req’d if battery no longer functioning. Operating Range Temp: 10 to 120 degrees F.
recorded on an hourly basis.